This is probably the most requested recipe to date. Whenever I make it and my friends or family members try it, everyone wants to know the recipe! So here you go, dear friends, family, and all the Lovetarians in the world – here’s the healthiest carrot cake recipe for you! Why is it so good for you? Well, there’s so much goodness in the pulp that’s left after juicing: vitamins, minerals, antioxidants and most importantly – dietary fibre! 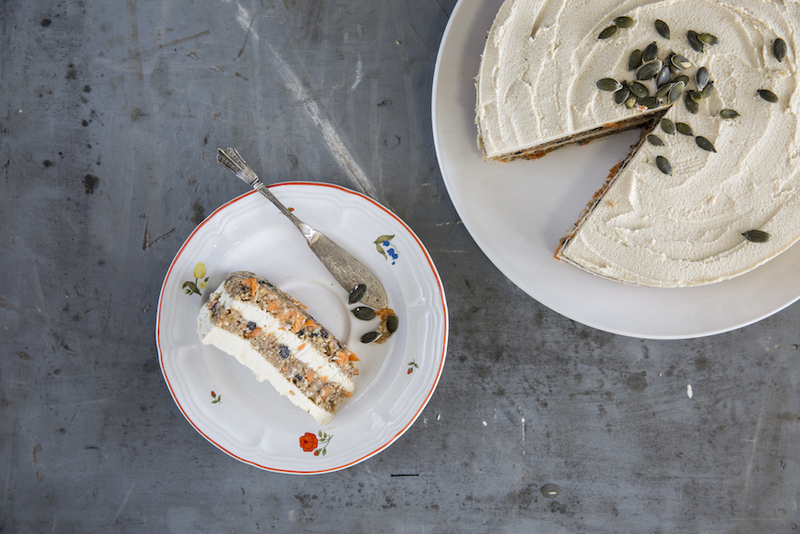 Layered lemon cashew cream and spiced carrot cake is a winner. No oven required! No dairy, gluten or refined sugar. Raw vegan, but still bursting with that carrot cake flavor and texture! 1. In the food processor, pulse the almonds, cashews, and half the coconut to a crumble. Transfer to a large mixing bowl. 2. In the large bowl, add almond meal, remaining coconut, grated carrot, currants, cinnamon, nutmeg, vanilla, and lemon zest to the nut crumble. 3. In the food processor, pulse dates, sweetener and coconut oil. 4. Add wet mixture to the dry mixture in the large bowl and mix together. 5. Line a 20cm springform cake tin with parchment paper. 6. Remove the cashew cream from the fridge and begin to layer your cake, starting with the carrot cake mix. Smooth with the back of a spoon and add a layer of cashew cream. Smooth and place back in the freezer for 15 minutes. 7. Remove from freezer and add another layer. Continue until you have used all of the carrot cake and cashew cream. 8. Replace in the freezer to set.